Glass Moulded Shades For Statue Lamp From France, For glassiegirl ! In Lamps > Lamp Shades > Show & Tell and Glassware > Show & Tell. Thanks to glassiegirl for all your help !! As I promised you, I am sending you photos of the lamps I needed shades for ! The first large lamp, not the marble, is Echo by J. Causse 40 inches, and the second large lamp is Diana Casting The Net by George Waagen, German artist (1833-1898). 36 inches. Several months ago I decided to lift some of my spare statue lamps off of the storeroom floor and onto tables and pedestals. I needed some new glass shades and I knew that it was better to ask an expert about them so I went to glassiegirl for some help. I gave her an idea of what I wanted and she sent me some great links to ebay France, which I cannot get on my computer. From there I was able to pick these dusty rose colour shades which there were 3 of. After I won the auction I got them in the mail within 5 days. The shades are all new in box. The shades were about an inch bigger than the smaller ones which I had in clear colour, and can be found more easily on this continent. Took the pics from my favourite chair with zoom on camera. The Echo lamp belonged to my friends Greg and Christine, and when their marriage desolved the antiques were either sold or given away. I got the lamp as a gift from Christine, as she was worried her dogs would break it, and they would have easily. Thanks again glassiegirl for all the help, I am blessed to have had help from someone as wonderful as you ! !~ Love to you Leah ! I clk'd LUV on this & then say who posted it. Should have known ! Each of us seems to have a style. Mine is "ghetto" style of course. LOL , BB2! Yours is rather outdoorsy ! But PhilMorris' style is certainly very very posh! I don't want to know how mine style is called. These lamps are fabulous !!! My lofty apartment looks ghetto style now LOL. Beautiful Phil...very beautiful. Perfect complement for your beautiful lamps, Phil! Thanks blunderbuss2, your "ghetto" of course is the view outside your window, Glorious St. Martins oceanfront view, magnifico !!! 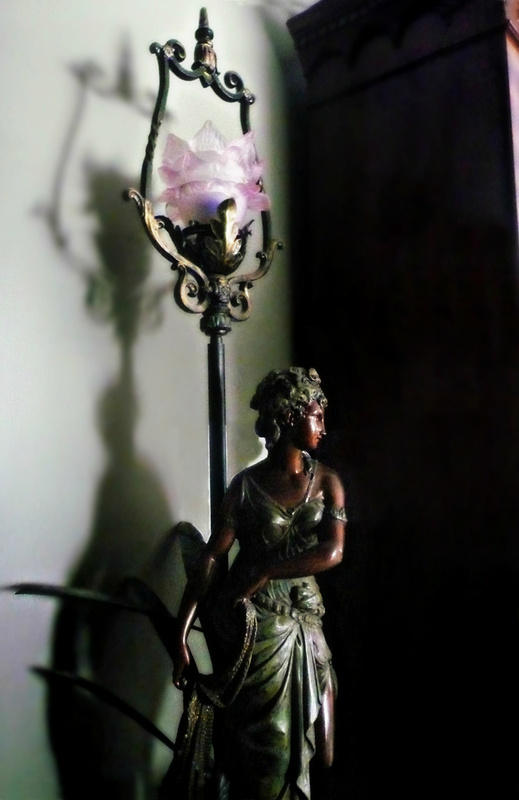 A spectacular lamp, everything looks so beautiful! OK Phil, so I set my ghetto standards just a bit high ! Hey, in a hard rain, I can't see the lagoon ! LOL!! Oh the remark blunderbuss2 - the hard rain you must endure broke my heart and I have equally hard tears pouring, just thinking of your suffering. You yourself are a Saint ! Thank you martika for your generous complement ! Thank you mcheconi for the compliment, but from the pics I have seen I envy your loft also. It reminds me of a few years back when I was out looking at condos and I seen a beautiful condo with exposed brick walls. Gosh I could see the place where I worked for many years from the window and I can't stop the dreams as it is ! Love your taste just as it is. Thought that when I first seen the clever use of Railroad Train model lamps !! Phil. I feel much better knowing that I have your moral support in these trying times ! That means a lot to me ! Actually, it hasn't rained that hard in years ! LOL !! Thank you kyra for the nice things you say ! Hi antiquerose, thank you for the comment. When you first were over I had the table covered with a black cloth to put things on, but normally do not use coverings for tables. Loving it again!! I can vouch for Phil's home. Been there, and it is just as in the Pics. A masterpiece of collections !!! Total Eye Candy !!! You still have your Coat of Arms on the wall - Phil ? 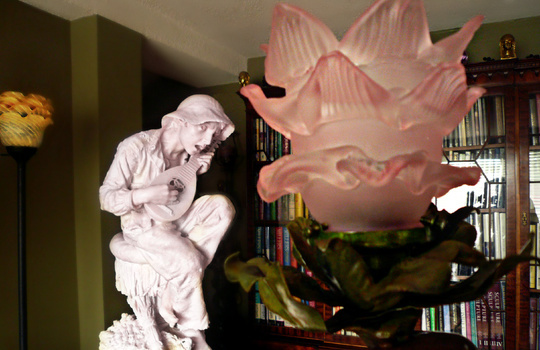 Love your bronze lamps, but the mandolin player is stunning! Thanks rocker-sd, Christies did the shipping in NYC and I got it 3 days after the auction. 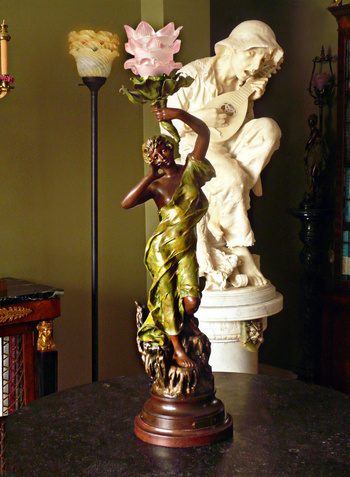 I had been to the auction to buy another statue but bought this one instead. Thank you rose, yes just as you last saw it. 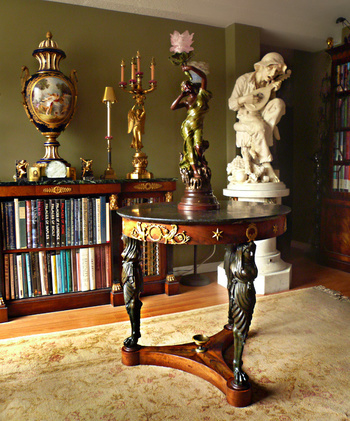 Exquisitely beautiful lamps, and I also love the bookcases! The Best collector of Fine Art ~ PHIL ~ Dazzling as always ! !